A grown adult requires more than 10000 liters of air everyday, breathing approx. 20000 times. It is therefore evident that the quality of the breathed air has a paramount impact on health and affects quality of life. Air pollution is considered responsible for a great number of deaths, as well as for respiratory and cardiovascular diseases. Nowadays, it considerably affects health and quality of life especially for people living in cities. 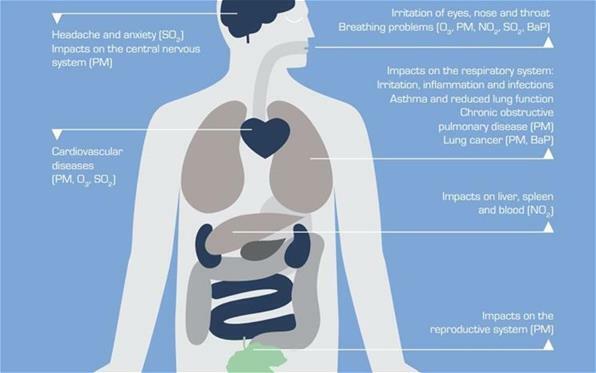 The following picture provides with a schematic representation of the basic impacts of certain air pollutants to health. Source: EEA Signals 2013 — Every breath we take. Improving air quality in Europe, European Environment Agency. More information on the health impacts of air pollution may be found in relevant scientific publications, which are available on-line. We therefore refer to the following publications for informative purposes only. Their inclusion in our web site does not impose any support of their content or any relationship to the DLI whatsoever. World HealthOrganization (2014), Ambient (outdoor) air quality and health fact sheet. Air is all around us, providing its vital breath to our existence. As the atmosphere surrounds both us and our activities it also serves as a large "contamination site" receiving the effects of these activities. These effects are related to the production air pollutants, which are harmful for man, the environment and the materials. Air pollution can lead to respiratory problems, exacerbated allergies, and have adverse neurological, reproductive, and developmental effects. This is especially true for vulnerable populations such as children, the elderly, pregnant women, those with heart or lung disease, and people with weakened immune systems. People who work or exercise outdoors may also be especially sensitive. Some information of the health effects of the major air pollutants are included in the relevant web pages. Disclaimer: The Department of Labor Inspection/Air Quality Sector accepts no responsibility or liability whatsoever with regard to the information on this site and the information does not necessarily reflect the official opinion of DLI or any other Cypriot governmental organisation whatsoever. The material on this site is not necessarily comprehensive, complete, accurate or up to date and may contain links to external sites over which DLI services have no control and for which the DLI assumes no responsibility. Neither the DLI nor any person or company acting on behalf of DLI is responsible for the contents of this website and the use that may be made of it. The content of this web site is of informative nature. If you believe that you may experience adverse effects to your health as a result of your exposure to polluted air, or you belong to the sensitive parts of the population, you are advised to consult your doctor/physician. Our goal is to keep the information within this web site timely and accurate. If errors are brought to our attention, we will try to correct them. Nitrogen oxide (NOx) is a term describing two gaseous pollutants: nitric oxide or nitrogen monoxide (NO) and nitrogen dioxide (ΝΟ2). Both originate from combustion processes (manly from industry and transportation), while the majority of NOx emissions consist of NO. Nitrogen oxides contribute to the production of Ozone and particulate matter. Combustion processes like the ones taking place within internal combustion engines are the main sources of nitrogen oxides. Nitrogen dioxide consists of 5-10% of the total emissions, with the exception of diesel powered vehicles where it can rise up to 70%. Approximately 60% of NOx emissions in Cyprus come from energy production and use, while 35% originates from transportation, according to a relevant fact sheet of the European Environment Agency. Excessive exposure to nitrogen oxides may cause health effects for the blood, the liver, the lungs and the spleen. The presence of sulfur dioxide can increase its negative health effects for humans, when compared with the effects of each pollutant individually. NO2 can also aggravate lung diseases leading to respiratory symptoms and increased susceptibility to respiratory infection. Nitrogen oxides take part in reactions with ammonia and other chemical compounds under humid conditions that lead to nitric acid, which usually forms droplets in the atmosphere. Health impacts of nitric oxide include breathing difficulties and increase in the frequencies of the respiratory system, that are accompanied by lung tissue damages and reduction of overall life expectancy. Small droplets have a negative effect to the lungs and may cause or exacerbate cardiopulmonary diseases like emphysema and bronchitis. Nitrogen oxides can easily react with organic substances and ozone, forming a wide range of chemical compounds that are toxic and may cause biological mutations. Moreover, high concentrations of nitrogen dioxide cause respiratory problems, especially to those suffering from asthma and to children. In addition, NOx contributes to the formation of ozone and particulate matter, with associated effects to overall air quality. Nitrogen containing species deposited on plants can act as nutrients, however high levels of NO2 and NO are damaging to plant life - they can hinder growth and stress plant life making it more susceptible to other effects such as disease and frost damage. Sulphur dioxide (SO₂) originates mainly from burning fossil fuels as well as from industrial processes, while volcanic eruptions constitute one of its main natural sources. This pollutant was associated with the first air pollution episodes ever recorded, and its concentrations are continuously decreasing in Europe in the last years. Every process that employs the combustion of fossil fuels with sulphur content is a sources of sulphur dioxide, like energy and heat generation and transportation (mainly of marine type). Approximatelly 60% of sulphur dioxide in Europe is emitted due to energy production and use. SO2 may contribute to particle formation via generating secondary sulphurous particles. Excessive exposure to sulphur dioxide may cause health effects concerning eye, lung and throat. Inflammation of the respiratory tract causes coughing, mucus secretion, aggravation of asthma and chronic bronchitis, and makes people more prone to infections of the respiratory tract. Mortality and hospital admissions for cardiac disease increase on days with higher SO2 levels. Moreover, sulphur dioxide is a major precursor to PM2.5, which is associated with significant health effects. Sulphur dioxide is toxic to a variety of plants and may produce visible signs of injury and/or reduce yields of certain crops. Paradoxically, beneficial effects may also be seen on some plants where sulphur dioxide can reduce the incidence of some fungal diseases-for example- the incidence of 'black spot' on roses is low in areas of high sulphur dioxide. Sulphur dioxide emitted in sufficient quantities at low or ground level can be combined with air moisture to cause gradual damage to some building materials (such as limestone) by forming an acid solution that gradually dissolves the stonework if it is constantly exposed. Sulphur dioxide gas dissolves in the water droplets in clouds causing the rain to be more acidic than usual. Acid rain affects the natural balance of rivers, lakes and soils, resulting in damage to wildlife and vegetation. Carbon monoxide (CO) is a gaseous pollutant with "deceitful" characteristics when it comes to its health impacts. It originates from the incomplete combustion of fossil fuels and biofuels, and is mostly found in urban areas. Carbon monoxide is emitted mostly from traffic, industry and households. For Cyprus 70% of CO emissions come from traffic while 20% result from energy production and use. Excessive exposure to carbon monoxide can have adverse effects to blood, brain and heart. CO reacts with other pollutants leading to the formation of Ozone at ground level, another pollutant with adverse health effects. Exposure to CO can reduce blood's oxygen-carrying capacity, thereby reducing oxygen delivery to the body's organs and tissues. Those suffering from cardiovascular disease are the most sensitive towards CO exposure. Such people already have a reduced capacity for pumping oxygenated blood to the heart, which can cause them to experience myocardial ischemia (reduced oxygen to the heart), often accompanied by angina (chest pain), when exercising or under increased stress. Short-term CO exposure further affects the already‑compromised ability of their bodies to respond to the increased oxygen demands of exercise or exertion. At extremely high levels, CO can cause death. Important: Carbon monoxide is produced due to incomplete combustion. This means that exposure to high levels of CO in closed spaces (households) where the air is not refreshed, can lead to loss of consciousness and death. In order to avoid such events, you should properly maintain all combustion equipment and systems used for heating and cooking purposes, and should avoid using coal-burning heaters and relevant devices indoors. Ozone (O₃) is a gas consisting of three atoms of Oxygen, that is not directly emitted by is formulated as a result of complex chemical reactions where solar radiation plays the role of the catalyst. For this reason ozone is considered (and called) a secondary pollutant. If available in the higher layers of the atmosphere (stratosphere), ozone acts as a filter blocking unhealthy ultraviolet radiation from the Sun. When in the lower parts of the atmosphere (troposphere), ozone becomes a major air pollutant that affects human health and the ecosystem. It is formed from complex chemical reactions following emissions of precursor gases such as nitrogen oxides and non-methane VOCs. At the continental scale, methane and carbon monoxide also play a role in O3 formation. Ground-level ozone is a powerful and aggressive oxidising agent, which can have a marked effect on human health. Moderate levels of ozone can irritate the eyes, nose, throat, and lungs. Children, especially asthmatics, are most at risk from exposure to ozone. Long-term exposures have been shown to cause significant temporary reduction in lung function in healthy adults undergoing physical activity. Some asthmatic individuals are especially susceptible to ozone toxicity, which includes constricting airways. Human population studies of long-term exposures to low-level ozone indicate that it may lead to permanent reduction in lung capacity; animal studies have shown chronic high-level exposures can cause lasting structural damage in the lungs. Short-term exposure can cause increased sensitivity to airborne allergens and other irritants, and it can impair the body's immune system. This is because ozone influences pulmonary function, causing lung inflammation and respiratory symptoms. This leads to increased usage of respiratory medication, morbidity, and mortality. PMs with a mean diameter less than 1 μm (they are commonly called ultra-fine particles and are denoted as PM1.0). Particulate matter can come from natural sources or anthropogenic sources. Natural sources include sea salt, naturally suspended dust like in the case of Sahara dust storms, pollen, and volcanic ash. Anthropogenic sources include fuel combustion in thermal power generation, incineration, domestic heating for households, and fuel combustion for vehicles. In cities, important local sources include vehicle exhausts, road dust re‑suspension, and the burning of wood, fuel or coal for domestic heating. Excessive exposure to particulate matter contributes to chronic respiratory problems and can increase the risk of cardiac arrest and premature death. Several studies link particle levels to increased hospital admissions and emergency room visits—and even to death from heart or lung diseases. People with heart or lung disease, older adults, and children are considered to be more vulnerable than other people, especially when they are physically active. People living for many years in areas with high particle concentration levels, have been associated with problems such as reduced lung function and the development of chronic bronchitis and even premature death. High PM concentration levels (especially those of PM2.5) as those recorded in many developed countries, have been associated with lung cancer and premature death. Moreover, particles can stick to the surfaces of buildings resulting in blackening of the facades. Research is currently underway to elucidate the role particulates play in climate change. Exposure to high particle concentration levels for a short period of time (hours/days) can aggravate lung disease, causing asthma attacks and acute bronchitis, and may also increase susceptibility to respiratory infections. In people with heart disease, short-term exposure has been linked to heart attacks and arrhythmias. Healthy children and adults have not been reported to suffer serious effects from short-term exposures, although they may experience temporary minor irritation when particle levels are elevated. Benzene (C₆H₆) is a volatile organic compound, and is found as an additive to petrol. It has a characteristic "sweet" smell due to its aromatic chemical character. Incomplete combustion of fuels is the largest source of benzene, thus 80–85 % of C6H6 emissions are due to vehicle traffic in Europe. Other sources of C6H6 include the handling, distribution and storage of petrol, as well as domestic heating and oil refining. Benzene is a known human carcinogen in long-term exposure situations, while it may also cause problems in the central nervous system, hepatic and kidney damage, may affect fertility and lead to problematic births. In cases of high concentrations sensitive parts of the population are advised to minimize outdoor activities and to consult with their physician. Persistent organic pollutants (POPs) are organic compounds with toxic characteristics. They are resistant to environmental degradation through chemical, biological, and photolytic processes. POPs bio-accumulate, i.e. they accumulate in the body of living organisms, while they are also dispersed via air and water, and they are carried by figurative species thus penetrating sea and land ecosystems. A major group of POPs is called dioxines and they are formed as an unintentional by-product of many processes involving chlorine such as waste incineration, chemical and pesticide manufacturing and pulp and paper bleaching. Another POP category is furans that are found as impurities in some heavy chlorinated chemicals and as by-products of combustion. The effects of dioxins on humans include increasing incidences of genital cancer and decreased fertility, increased occurrence of breast cancer and endometriosis, boosting of the number of diabetes cases in the population, adverse effects on the immune system, abnormalities in learning ability and behavior of the youth etc. It should be noted that there are 135 species of furans and 75 species of dioxins. The severity of the impacts that POPs have to human health and the environment has led to the Stockholm Convention on persistent organic pollutants (POPs) and to EC decision 2006/507/ΕΚ. The convention has been ratified by Cyprus via national law 42(III)/2004. Cyprus has been monitoring POPs levels already from 2006 with a passive sampler installed at Ayia Marina station. In addition, Cyprus has published in 2007 the national implementation plan for the Stockholm convention, in order to reduce POP levels. More info on POPs can be found in the relevant web pages (Air Pollution > POPS).